Duvel is one of the most iconic beers on Earth. This benchmark for the Belgian Strong ale style is devilishly tasty, but it also packs a wicked strong kick at 8.5% ABV. So what’d they do two days ago? They nipped it in the bud (sorry, shouldn’t say Bud here). The Dutch love putting beer–any beer including Grolsch–into little bottles and even have their own word for it, “flesje.” In short, Duvel, Brabantian for “devil,” is now available in 18-cl nip bottles (just 6 oz.)! Duvel Moortgat today launched the Mini, a great addition to the range of this family, Belgian specialty beer brewery….Each bottle of Duvel 18cl Mini instead of 33cl. Contains These irresistible little Duvel is marketed for lovers of distinctive tastes, quality preferable to quantity. With Duvel Mini can be extra enjoyed all the different beautiful moments of the day: a drink after work, an appetizer at dinner or during a nice evening in a grand café. 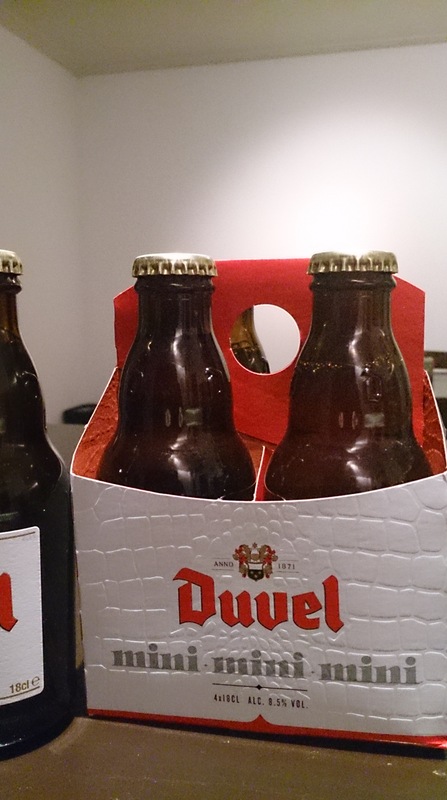 Duvel Mini is now available at the supermarket and in the hospitality industry and better …put in a seductive campaign. The Belgian specialty beer has a striking, distinctive bottle that fits the unique taste: on the supermarket shelves are now the next big bottles of Duvel Mini bottles with the same design…Duvel Mini also offers quality and great taste delight to enjoy the little moments that ask for a glass of specialty!